Paul Ryan for Speaker: Conservative Freedom Caucus signals it might support former VP candidate for House's top job. 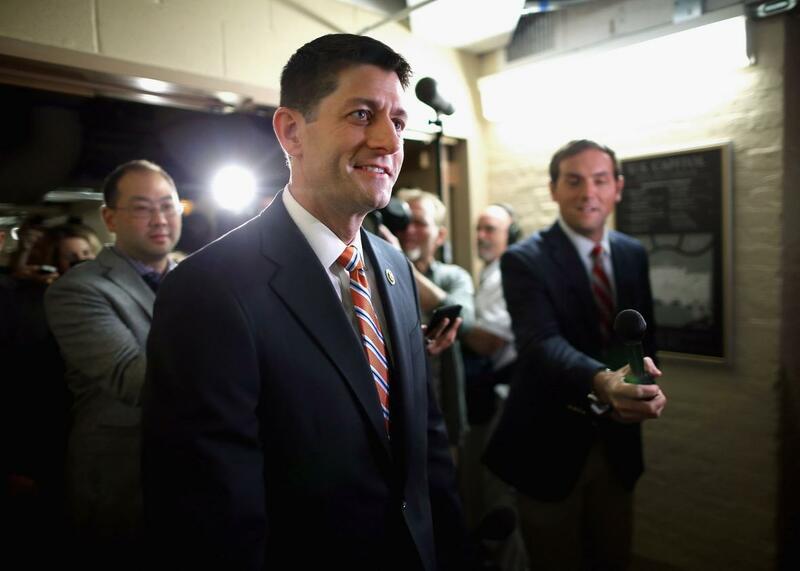 Paul Ryan heads for a GOP caucus meeting in the basement of the Capitol on Oct. 9, 2015. In a Fox News interview Sunday, the head of the ultra-conservative House Freedom Caucus hinted that the group might not oppose, and could even “look favorably” on, the idea of Speaker of the House Paul Ryan. Ohio Rep. Jim Jordan’s noisy faction, which was instrumental in bringing about Speaker John Boehner’s sudden resignation in September and helped drive consensus replacement candidate Kevin McCarthy to drop out of the running, has already endorsed a little-known Florida hard-liner for speaker but “of course we’re willing to compromise,” Jordan said. When the Freedom Caucus was formed last winter, it was due in no small part to resentment over what members saw as a bloated compromise budget that Ryan brokered with Democratic Sen. Patty Murray. If they decided not to torpedo Ryan, widely seen as the only House Republican currently able to pull together 218 votes in the fractured caucus, it could be a sign that the notoriously stubborn group is willing to bury the hatchet on some issues if the alternative is letting the GOP blow apart at the seams. The “Draft Ryan” campaign continued over the weekend and, while he’s shown a few signs of being persuadable, he hasn’t renounced his official position of one thousand times no, though it’s apparently been revised to no comment. Ryan reportedly cleared his calendar of fundraisers for two solid days after McCarthy announced he was dropping out—a wise move, since it could be difficult to schmooze donors with several dozen Republicans clinging to your ankles toddler-style, begging you to save the party. Washington, D.C., is now in roughly its 76th hour of Ryan Watch. With Congress out of session, the Wisconsin congressman has retreated home to Janesville, where unnamed sources tell CNN he’s “thinking and praying on it.” Given the frenzy he’s ignited, it wouldn’t be surprising if half the GOP establishment flew into Milwaukee and dropped by just to say hi and see if Paul got all their messages about that job he might be interested in. It comes with a pretty sweet office.